On the evening of March 27, Catholic Days at the Capitol came to its official conclusion with the 44th Annual Red Mass of the Holy Spirit. All nine bishops of Florida were present to concelebrate the Mass at the Co-Cathedral of St. Thomas More in Tallahassee. 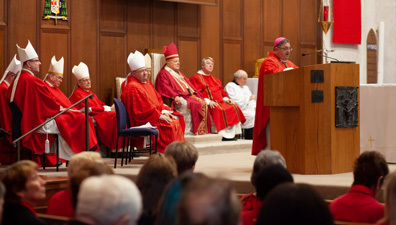 The Red Mass provides an annual opportunity for bishops and the lay faithful to gather in prayer with elected and appointed officials as one body in Christ. Congregants invoke the Holy Spirit, praying that those who serve in the executive, legislative and judicial branches of government will be divinely inspired and guided as they carry out their work for the people of Florida. Bishop Enrique E. Delgado, an auxiliary bishop in the Archdiocese of Miami, offered the homily. He assured those present, including Catholic Days participants, members of the Florida bench and bar, legislators and state agency officials, "The Holy Spirit will guide us if we put our trust in the Lord." 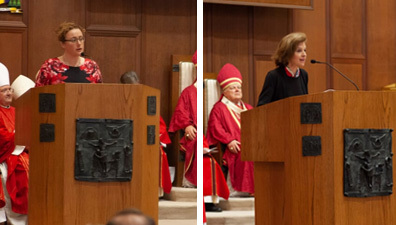 Representative Erin Grall (above left), District 54, Vero Beach, and Helen Aguirre Ferré, director of communications, Executive Office of Governor DeSantis, served as lectors at the Mass. Additional Red Mass photos are available on our website and Facebook page.